My girls have a few special teachers they want to thank as summer vacation quickly approaches. 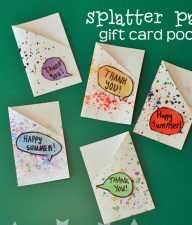 We love to add a personal touch to bookstore or coffee shop gift cards. 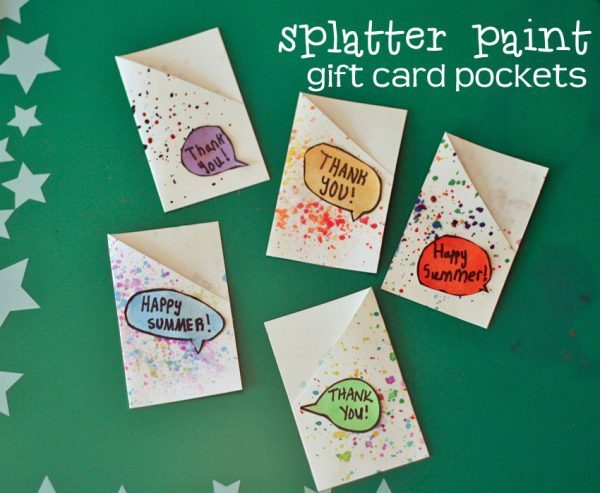 This year, we’re handing out these adorable splatter-painted gift card pockets. I love the fun painted background with the colorful speech bubble on top. So cute! These pockets are so simple to make, and you can easily make a bunch in one sitting. 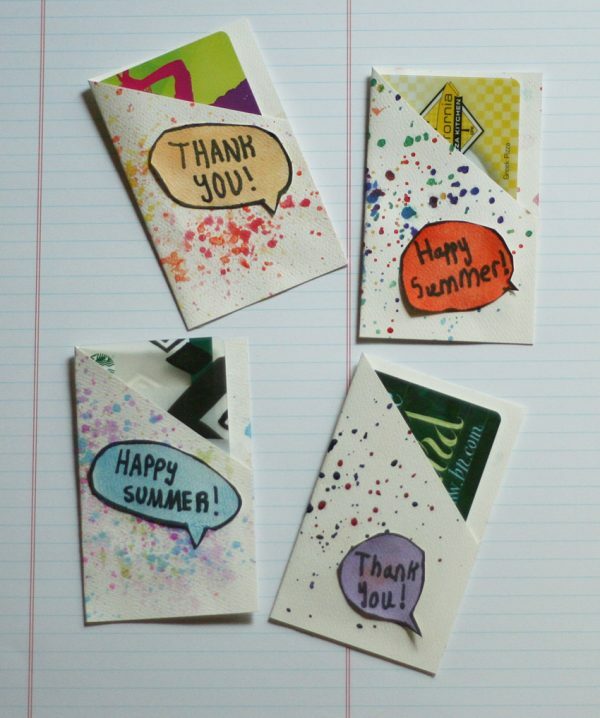 To make standard gift-card sized pockets, cut watercolor paper into 4″ x 5″ pieces. 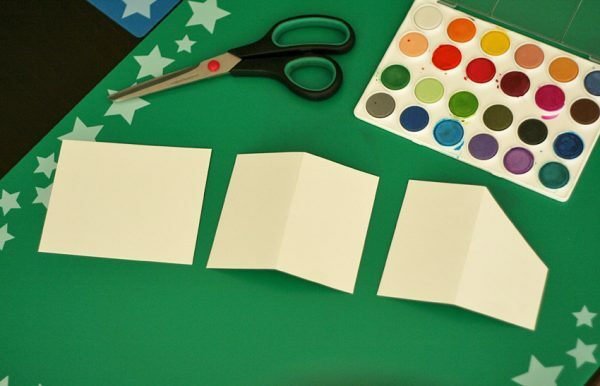 Fold each rectangle in half, then cut the top corner off one side. This will allow the gift card to peek out of the pocket. For this project, we splatter painted by tapping a paintbrush against a pencil. It’s not super messy, but there will be a little paint flying, so protect your work area. 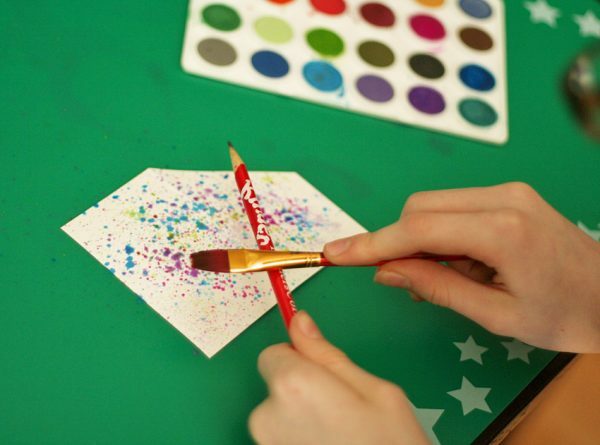 Wet a brush and load it with watercolor paint. Working over your paper, tap the brush against a pencil, moving around as you tap. Continue adding as many colors as you like. 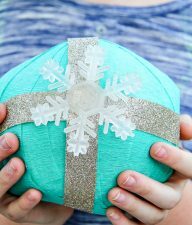 While the pockets are drying, make a little speech bubble to place on the front. With a permanent marker, write your words, then draw a speech bubble around them. Paint over the speech bubble with watercolors. Let dry, and cut out. When all your pieces are dry, it’s time to assemble. 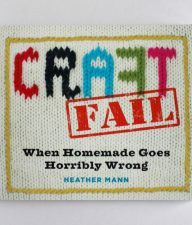 Fold the pocket in half and glue just the bottom and side. A tape runner works really well for this. Glue your speech bubble sentiment on the front of the pocket. 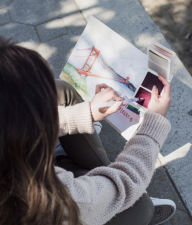 Then, tuck a gift card inside and it’s ready to express your thanks or brighten someone’s day!